"The United States has been inspired by the Syrian peoples' pursuit of a peaceful transition to democracy. They have braved ferocious brutality at the hands of their government. They have spoken with their peaceful marches, their silent shaming of the Syrian regime, and their courageous persistence in the face of brutality - day after day, week after week. The Syrian government has responded with a sustained onslaught. I strongly condemn this brutality, including the disgraceful attacks on Syrian civilians in cities like Hama and Deir al Zour, and the arrests of opposition figures who have been denied justice and subjected to torture at the hands of the regime. These violations of the universal rights of the Syrian people have revealed to Syria, the region, and the world the Assad government's flagrant disrespect for the dignity of the Syrian people. "The United States opposes the use of violence against peaceful protesters in Syria, and we support the universal rights of the Syrian people. We have imposed sanctions on President Assad and his government. The European Union has imposed sanctions as well. We helped lead an effort at the UN Security Council to condemn Syria's actions. We have coordinated closely with allies and partners from the region and around the world. The Assad government has now been condemned by countries in all parts of the globe, and can look only to Iran for support for its brutal and unjust crackdown. "The future of Syria must be determined by its people, but President Bashar al-Assad is standing in their way. His calls for dialogue and reform have rung hollow while he is imprisoning, torturing, and slaughtering his own people. We have consistently said that President Assad must lead a democratic transition or get out of the way. He has not led. For the sake of the Syrian people, the time has come for President Assad to step aside. 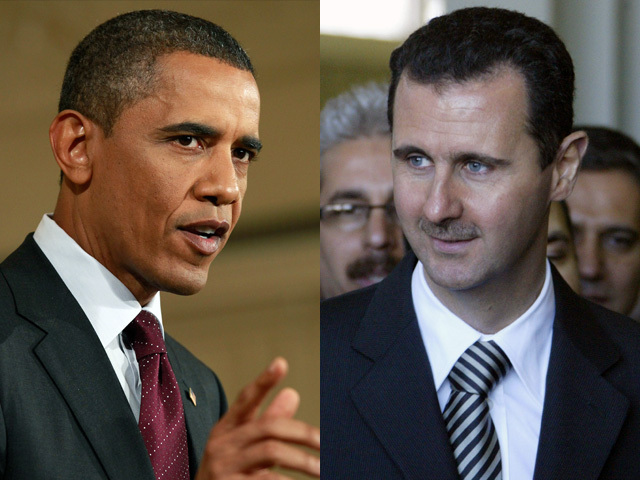 "The United States cannot and will not impose this transition upon Syria. It is up to the Syrian people to choose their own leaders, and we have heard their strong desire that there not be foreign intervention in their movement. What the United States will support is an effort to bring about a Syria that is democratic, just, and inclusive for all Syrians. We will support this outcome by pressuring President Assad to get out of the way of this transition, and standing up for the universal rights of the Syrian people along with others in the international community. "As a part of that effort, my Administration is announcing unprecedented sanctions to deepen the financial isolation of the Assad regime and further disrupt its ability to finance a campaign of violence against the Syrian people. I have signed a new Executive Order requiring the immediate freeze of all assets of the Government of Syria subject to U.S. jurisdiction and prohibiting U.S. persons from engaging in any transaction involving the Government of Syria. This E.O. also bans U.S. imports of Syrian-origin petroleum or petroleum products; prohibits U.S. persons from having any dealings in or related to Syria's petroleum or petroleum products; and prohibits U.S. persons from operating or investing in Syria. We expect today's actions to be amplified by others. "We recognize that it will take time for the Syrian people to achieve the justice they deserve. There will be more struggle and sacrifice. It is clear that President Assad believes that he can silence the voices of his people by resorting to the repressive tactics of the past. But he is wrong. As we have learned these last several months, sometimes the way things have been is not the way that they will be. It is time for the Syrian people to determine their own destiny, and we will continue to stand firmly on their side."